Tues 17. I was appointed officer of the day, but not feeling very well lieutenant Mayer acted for me. 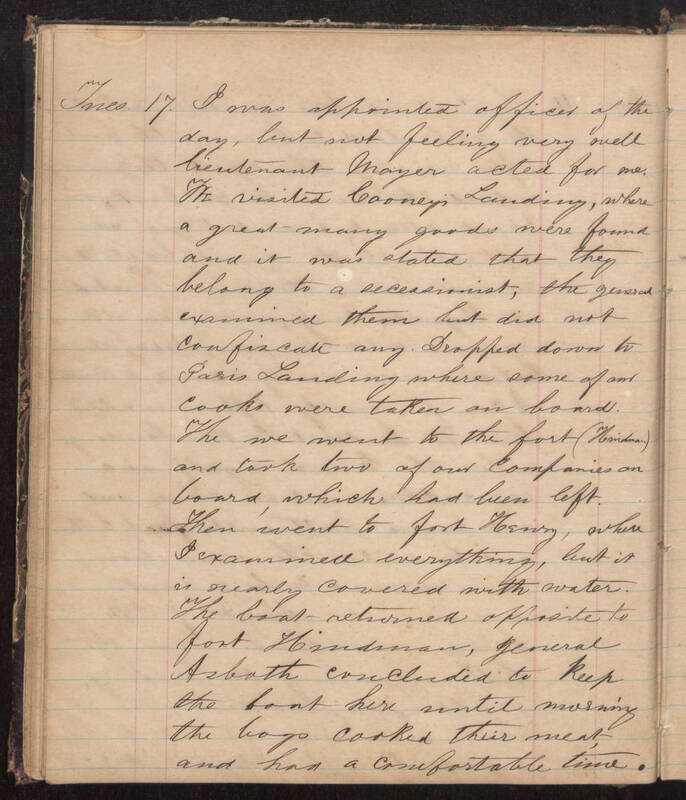 We visited Cooney’s Landing, where a great many goods were found and it was stated that they belong to a secessionist, the general examined them but did not confiscate any. Dropped down to Paris Landing where some of our cooks were taken on board. The we went to the fort (Hindman) and took two of our Companies on board, which had been left. Then went to fort Henry, where I examined everything, but it is nearly covered with water. The boat returned opposite to fort Hindman, general Asboth concluded to keep the boat here until morning the boys cooked their meat and had a comfortable time.